ISLAMABAD: Febuary 3,2019- Civil society representatives’ meeting had been held at National Commission for Human Rights (NCHR). Activists showed their reservations on the recently Punjab Domestic Workers Bill 2018 which has been passed by the Punjab Assembly which allows the age of Child Domestic Labour starting from 15. According to the civil society’s representatives, it’s a violation of child rights, which must be banned, not regulated. During the consultation it was decided that with the collaboration of NCHR, Final Amendment Bill would be drafted to raise the age of labour up till 18. Activists have shared research and evidence based logical concerns and proposed points of amendment to NCHR. 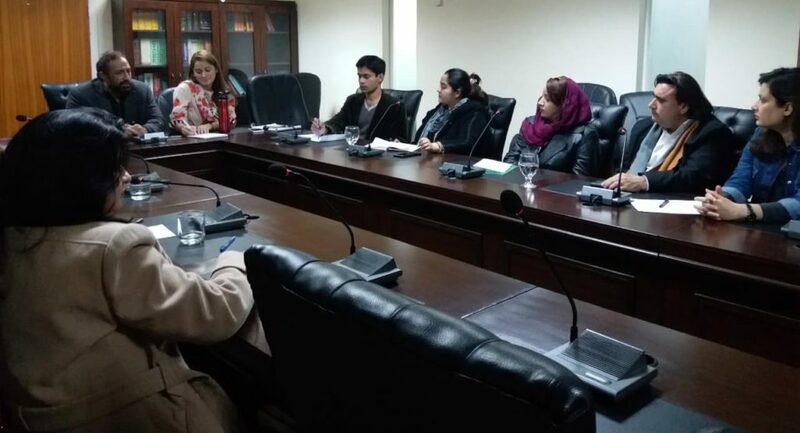 It was also decided by the representatives of civil society during meeting that Ms. Imrana Jalil (Activist & Consultant) will share final draft with quorum to get endorsements and comments on draft, further it will be shared with National Commission for Human Rights (NCHR) on behalf of civil society. While at the end, Mr. Haseeb Khawaja (Activist & Documentary Filmmaker) said that he is thankful to NCHR and particularly Mr. Chaudhry Shafiq (Human Rights Commissioner, NCHR) for their support and commitment. He further added that as an organizer of this consultation meeting, he is happy that significant members of civil society have participated in the meeting. This is reflection that being united we are going to achieve many good things for the Pakistani children and as a responsible citizen we are playing our positive role towards Child Labour Free Pakistan.